More than two hundred people crowded the dance floor to dance tango while La Rubia del Norte, the DJ Ilene Marder, started off the night with a fast and traditional song. The pairs swirled with elegance, the women surprisingly agile with their heels and flowing dresses, and the men light on their feet with their leather shoes. You could distinguish with one glance between the experts, the ones that danced as easily as they walked, and the novices, the ones that moved slow at first, tying to find the rhythm before starting to dance with sincerity. As the night went on, it seemed like the partners were moving in unison, in complete harmony. This night was the fourth annual tango night in the Spiegeltent (literally, a tent of mirrors) of Bard College, and it was a spectacular success. In august Gustavo Naveira and Giselle Anne, two authentic Argentinian tango instructors, told the story of the cultural and historical reach of the Tango in a magical night at the Bard Campus Speigeltent. They showed pictures and videos of the dance teachers through the years and told stories of their most exciting performances. Later followed a tango class for the beginners. The evening concluded with a spectacular milonga, with experts and beginners dancing together in a blur of joy. But how was it that so many people, especially professional dancers, came together to dance the tango that night? More than 250 people went to dance tango at a sold out event. The Hudson Valley isn’t a big city (in fact, it’s not a city), and you wouldn’t expect there to be a strong tango community here. The event that brought Naveira and Anne to the Speigeltent was organized by Chungin Goodstein, who has taught tango at Bard College for various years. Undoubtedly the two very famous teachers drew a crowd from all over. But the events of the past years also convened hundreds of people. And it’s because there is a large and active tango community in the area. The year is 2003, and a woman by the name of Ilene Marder is working at a little hotel next to the Catskill mountains. A friend of hers advises that she take a dance class, and Marder accepts. But what type of dance should she take? She doesn’t have any dance experience, although she has experience with music, especially jazz. She doesn’t want to ballroom dance; to her it seems too rigid. At long last, she finds a beginners tango class in Albany, NY, taught by Dario Da Silva, a young Argentinian dancer. Even after all the work of finding a dance that she likes, because she couldn’t find a class in her area, Marder almost turns around and goes home. But, she didn’t turn around and she went to the class. That first class would change her life and the tango community in the Hudson Valley forever. Ilene fell in love with tango. She started taking private classes, and then started to organize monthly milongas in the hotel she she worked. For more than five months, people came from all over, including from New York City, to dance authentic argentine tango. In those days, there were only two tango groups in the area: one in Albany and the other in south Fishkill. Although the milongas in the hotel were very successful, the tango dancers in the Hudson Valley wanted more. And so Woodstock Tango was born. In the fall of 2004, the first milonga of Woodstock Tango took place at Mountain View Studio. The group grew quickly. It was the first group in the Hudson Valley that offered visits from internationally renowned tango dancers every month. As a foundation formed for the tango community in the Hudson Valley, events started to appear all over Ulster County. Suddenly there were events where you could dance argentine tango in Kingston, Rhinebeck, Mt. Tremper and Albany. The number of expert dancers that assisted these events grew as well. When Marder started to dance tango, there weren’t many experienced dancers in the Hudson valley, and those that there were had experience in performance tango, not social tango. Performance tango is the flashy tango that you see on television, the kind you can’t dance in a group (because it requires too much space). Social tango is much more about communication between partners and is the kind that people dance at milongas. The arrival of authentic argentine tango to the Hudson Valley caught the attention of dancers from all over, including New York City. The presence of so many new dancers allowed the community here to grow, and allowed participants to dance with people from outside their fixed social circles and become better dancers. The influence of regular milongas, new classes, and dancers from outside the community caused the number of expert tango dancers to increase from a handful to more than 300. More than 100 people attended the tenth anniversary of Woodstock Tango in 2014. Woodstock Tango doesn’t exist anymore, but others have appeared to take its place. David Salvatierray and Maia Martínez are young partners from Argentina with a range of dance experience in tango as well as Latin dance. The pair teaches many classes and carries out events all over the area, especially in Fishkill, Beacon, Newburgh, and Rosendale. Maia continues Ilene’s tradition of bringing international dance instructors to the Hudson Valley to teach workshops. Martínez came to the United States from Argentina as a nanny many years ago, and since then has created with Salvatierra: Dojo Dance Company, a space where you can learn to practice the arts of tango, salsa, karate, and much more. Nancy Ruiz, an attendee of Martinez and Salvatierra’s milongas, says about them: “Both Maria and David have that patience and tact to teach people. Not everyone has that quality, even if they have a million problems they are always smiling”. Nina Jirka and Ellen Chrystal, professional tango dancers and instructors, founded New Paltz Tango eight years ago with the objective of giving regular classes to teach the basics of two by four rhythm tango. They have classes for beginners and intermediate dancers and they host milongas with live music at Unison in New Paltz. Viva Feiner and Tara Ryan are two more dancers from the area that organize fantastic weekly and monthly milongas in Kingston. Well, anyone! According to Martínez, “People come from everywhere. We have people that drive three hours from Massachusetts to come here, people from Newburgh, Kingston, Woodstock, all the way to New Jersey. All cultures, all ages”. For example, Ruiz, a resident of Rosendale, doesn’t have formal dance experience but loves to dance at milongas. She says that watching Martínez and Salvatierra dance brings her lovely memories of her father, who danced the tango with her when she was little in Mexico, her native home. Although most of the tango you see on television requires expensive heels and fancy clothes, the community here focuses on the dance and the closeness it brings. 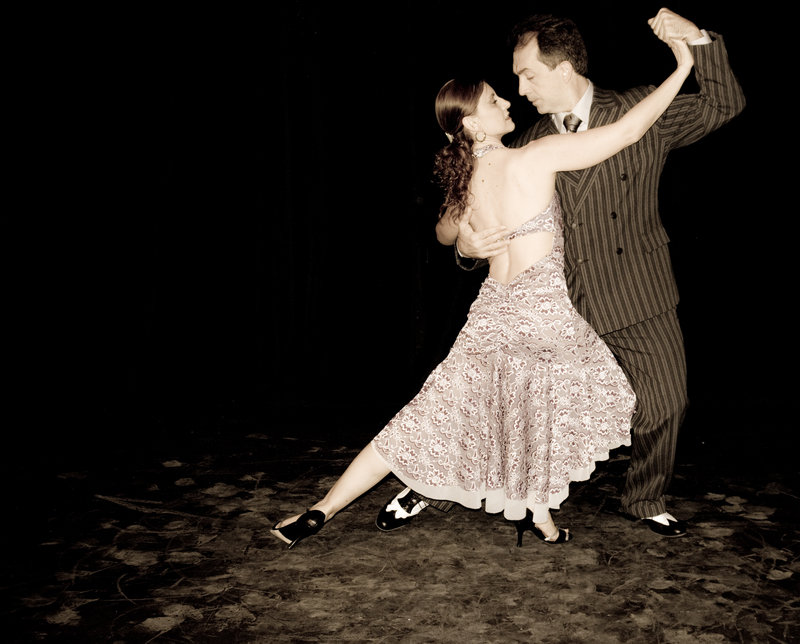 Social tango is pure communication; there isn’t a place for anything ostentatious. Jirka in particular emphasizes the necessity to return to simplicity: “often people have the idea that tango means heels and a male chauvinistic culture, but tango doesn’t have to be like that”. She encourages the dancers in her classes to use sensible shoes and whatever clothes are comfortable. The focus is the communication between dancers, not how much their shoes cost. Yes, anyone can dance the tango, but the dance usually requires a pair: a woman and a man. It’s also true that in the Hudson Valley, there are more women who dance tango than men. As a result, a lot of women around here assume the role of leader or guide that is typically given to men so as not to depend on them. This happens quite often in small communities, and the tango community here is much more relaxed about the gender norms that still exist in Argentina. There’s an environment of acceptance, where anyone can lead or follow and dance without fear. Why do people that dance the tango love it so much? There certainly are many answers to this question, but I leave you with one from Maia Martínez: “The tango is embrace. I dance a lot of different rhythms, like the folkloric argentine, where there isn’t physical contact but instead a distance of about two meters between dancers. The tango came to break that physical barrier, that barrier of not touching, that barrier of shame. That’s why I always insist in the idea of respectful touch and loving embrace. And it isn’t a sexual thing at all. It’s still passionate, still romantic, but it’s a different type of connection. I think this has become especially important in the United States because it serves as an excuse for contact. In the culture we live in today there is a lack of physical contact, the respect for another person’s body, without a negative intention”.